Is Daniel too old under 607-based chronology? One argument used in an unsuccessful attempt to disprove 607, is the idea that Jehovah's Witnesses chronology makes the prophet Daniel too old to be realistic. We can see there were clearly “three years” of training before Daniel went before the King. So what is the problem? The issue lies in the next chapter of Daniel, which starts by saying, “And in the second year of the kingship of Nebuchadnezzar, Nebuchadnezzar dreamed dreams”, a dream which Daniel interpreted. Now, if Daniel was in the court of Nebuchadnezzar in the “second year” of his Kingship to interpret the King's dream, then according to Jehovah's Witnesses chronology, Daniel would be in Babylon in 624 BCE. This means he must have been 101 years old when he served in the court of Darius. This is highly unlikely. Does that make the 607 chronology unlikely? No, because that is not what Jehovah's Witnesses teach. As we have already seen, the Bible says Daniel was under training for “three years” before he went before the King. So, then, why does Daniel says “in the second year” of Nebuchadnezzar? As we mentioned earlier, Daniel is speaking from the perspective of the Babylonian Kingship over the Jews. That is why he spoke of Jehoiakim's third year of Babylonian Kingship. Similarly, Daniel is also talking about Nebuchadnezzar's Babylonian kingship over the Jews. This was the “second year” of Nebuchadnezzar being direct King over the Jewish people. Yes, it was the second year after the destruction of Jerusalem when the last Jewish King was removed from his throne. This must be correct, for the claim of the apostates is preposterous. So the apostates would argue that Daniel, as one of the “children” still learning the local language, had only been in the city several months before he was regarded as, not a child, but as an able-bodied man and one of the wise men of Babylon. Also, he became ruler over the entire City, and all of this happened before Daniel had even been brought in before the King for the first time at the end of his three-year basic training. Can we really take such an idea seriously?
) Jeremiah does not mention any earlier exiles, so Daniel could not have been in Babylon in the second year, for that is too early. This 607 interpretation also gives Daniel more than enough time to grow out of childhood and become known as an “able-bodied man” and a well-known wise-man. Daniel interprets the dream in Nebuchadnezzar's 2nd year. Even if Daniel interpreted the dream on the very last day of Neb's 2nd year around April 602, there is still 9 or 10 months before Daniel's 3 years end in Jan/Feb 601. Thus Daniel's 3 years of training in essence becomes 2 years of training or even more than likely even less than 2 years since it is unlikely that he just happened to interpret the dream on the last day of Neb's 2nd year. The 3 years were a full 3 years — not any less. The Bible says, “for three years, that at the end of these they might stand before the king”. Note: Actually, this date of Aug 605 is impossible. At that time, secular history records Neb returning home to be crowned king in Babylon. He could not have taken exiles with him at this time, nor did he have enough time between to travel from Carchemish to Jerusalem then back to and Babylon. He returned to Syria/Palestine in Jan/Feb 604 and this would have been the earliest possible date that Daniel could have been taken. The narrative itself shows that Daniel could not have already become known to the King in Nebuchadnezzar's 2nd year of Kingship. Remember, the 587-based interpretation insists that Daniel has already been made ruler of the district, and head of all the wise men of Babylon, before the end of his training and before he has been brought in before the King for the first time, and while he is still a teenager. The book of Daniel is supposed to be in chronological order, but according to this theory, events in chapter 2 happened during events in chapter 1 (the 607 interpretation does not have this inconsistency). When Daniel said the “second year” of Nebuchadnezzar's kingship, it is abundantly clear he meant Kingship over the Jews, otherwise the sequence of events make no sense. It is the 2nd year since the destruction of Jerusalem. It is the 2nd year since there was no king sitting on Jehovah’s throne at Jerusalem. It was the 2nd year that Nebuchadnezzar assumed that position over God's people. It is his 2nd year as world ruler, in fulfilment of the 70-year prophecy. Daniel completed 3 years of training before seeing the King. 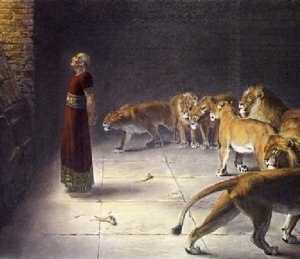 Daniel interpreted the dream in the King's 2nd year of kingship over the Jews. ...and means the dates of his training do not add up. Daniel remained under 100 years of age while serving Darius.